A Medical Body Area Network (MBAN) consists of small, intelligent devices worn on or implanted in the body which are capable of establishing a wireless communication link. Applications of MBAN sensors include for example, blood pressure monitoring, body temperature measurement, or prolonged recording of an electrocardiogram. Using a MBAN untethers the patient from traditional wired equipment and affords physical mobility and freedom, such that they may be no longer compelled to stay in the hospital. Recent advances in wireless body area networks applications are focused on integration of RF transceiver modules with embedded signal processing and sensor circuitry for small, low power wireless nodes. Therefore, it is important for the wearable devices to be of small in size, low cost and lightweight. They must be also comfortable and conformal to the body shape, at the same time maintaining high performance in terms of reliability and efficiency. The desired antenna for on-body or over the body surface communication is a monopole antenna due to the nature of the radiation pattern. However, the height of the monopole antenna from the surface of the body means that it is impractical and uncomfortable for the wearer to carry around. 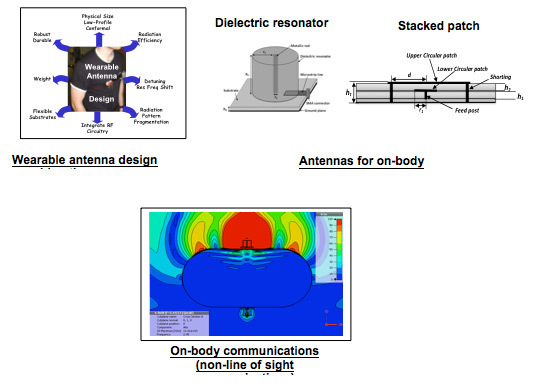 The WiSAR antenna team investigate and develop low profile antennas with high on-body efficiency and with similar radiation characteristics to that of a monopole antenna. The antenna are designed and optimised through simulations using CST Microwave Studio and the prototypes are experimentally tested using R&S ZVB8 network analyser. One solution to a flexible antenna is to make it entirely from textile materials. Textile materials are an interesting choice of substrate for flexible antennas due to the fact, they can be easily integrated into clothing. These textile materials generally tend to have a very low dielectric constant, which reduces surface wave losses and improves the antenna’s impedance bandwidth. Textile antennas offer low-cost, lightweight, flexible alternatives when compared with their rigid counterparts. WiSAR have successfully designed a fully textile antenna, utilising a felt fabric substrate and copper and nickel plated polyester as the conductive radiating and ground elements of the antenna. 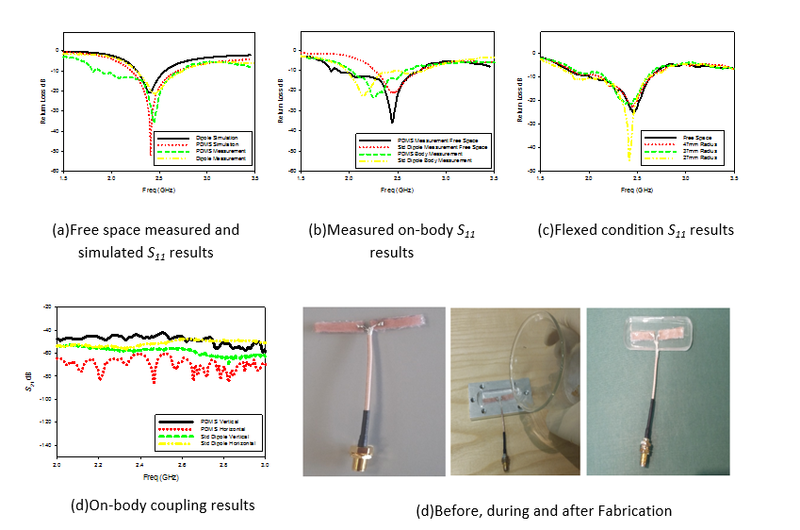 The measured and simulated results of the WiSAR designed 2.45GHz fully textile patch antenna are shown below. The antenna was designed and simulated with the use of CST Microwave Studios, which is a state of the art electromagnetic simulation software package. Once the design was optimised through simulation the antenna was then fabricated and measurements were then performed on the WiSAR’s Rhode and Schwarz two-port ZND network analyser. The design demonstrated excellent free space performances and showed promising results in various positions around the body. The measured performance along with the fact the antenna is flexible, make the design an excellent candidate for WBAN applications. Flexible antennas that conform to the shape of the human body can vastly improve the comfort of the wearer. WiSAR have been investigating the suitability of various flexible materials, which could be utilised as the substrate for antenna designs. One such material, which WiSAR have successfully used in the design of a flexible antenna, is Polydimethylsiloxane (PDMS). PDMS is an organic polymer and is the most widely used silicon-based organic polymer, particularly known for its unusual rheological (or flow) properties. PDMS is optically clear, and, in general, inert, non-toxic, and non-flammable. It also has desirable RF characteristics, which make it suitable for antenna design. Shown below are the measured and simulated results of the WiSAR designed half-wave dipole embedded in a PDMS substrate. The antenna was designed and simulated with the use of CST Microwave Studios, which is a state of the art electromagnetic simulation software package. Once the design was optimised through simulation the antenna was then fabricated and measurements were then performed on the WiSAR’s Rhode and Schwarz two-port ZND network analyser. The design demonstrated excellent free space performances and showed promising results in various positions around the body. The measured performance along with the fact the antenna is flexible, make the design an excellent candidate for WBAN applications.